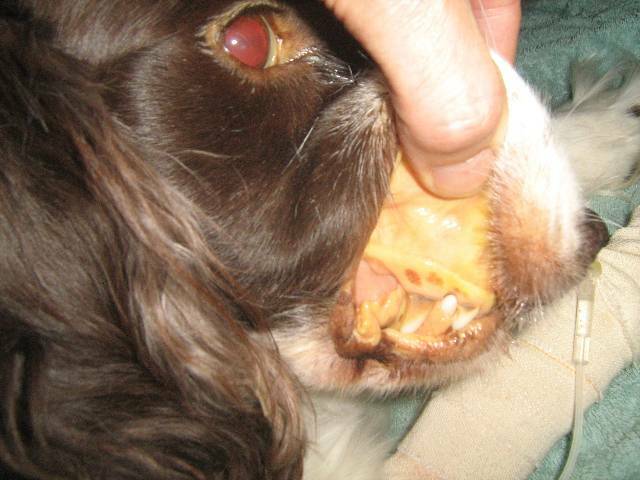 Jemma, an eight year old female Springer Spaniel, was first seen in March 2009 with severe jaundice, anemia, yellow urine, anorexia, and weight loss of 3 days duration. The owners thought she might have been bitten by a snake while they were away for 2 days and Jemma was in their family’s care. Blood tests revealed autoimmune hemolytic anemia (AIHA) and some inflammation of the pancreas. Jemma is a dog who barks excessively and startles easily; she barks at children from the car and is protective at the fence, when the postman comes to deliver the mail. She will attack suddenly and is jealous. She will try to bite her owner if she tries to take anything away from her or goes near her dinner, other dogs if they all try to go out the door at the same time, and any vet who behaves tentatively; she will bite and mean it - she draws blood. Despite her territorial behaviour, Jemma loves to be patted and is timid (sooky) in our surgery. She loves the rain and will take her food to eat in the rain. She will not lie in the sun. She chases the birds in the backyard, she hates them. Crotalus horridus 30c in 1 dose, a blood transfusion, and vitamin injections. Recovery was slower than I expected and after 3 days the remedy was changed to Ferrum phos 30 then to Phosphorus 200. She improved slowly over a 10 day period and started eating and drinking again. Two weeks after the initial blood transfusion, however, all the symptoms returned; the liver felt enlarged, she was feverish (39.2), and panting. Her head felt hot and she would not eat. An ultrasound was performed with the only result being an abnormally enlarged liver and, again, the specialist made a diagnosis of AIHA. She received another blood transfusion; I prescribed Crotalus horr 30c, 1 dose, and started her on Phosphorus LM01 daily. Two weeks later, the same symptoms returned. She received a third blood transfusion and this time I prescribed Crotalus horr 6c, 3 times daily. Phosphorus was discontinued. She improved steadily over a period of 5 days and the jaundice settled as well as the anemia. At this time, the potency was changed to Crotalus horr 200c, every second day. Eventually, the frequency was lowered to once weekly, then once every 2 weeks and was finally stopped. Nine months later, Jemma has remained well. She is a happier dog than she was previously and she has more energy. I battled throughout this case to make a distinction between Phosphorus and Crotalus horridus. She was so different at my surgery; she was always very affectionate and yielding. She was also very ill during her treatment so there was no ‘snake’ behaviour seen by our staff initially. She lives with the grandmother of the family, who is quite ill and weak, and is very loyal to her. My repetorisation was filled with jaundice, anemia, cares for family, forsaken delusions and black urine. The main reason for selecting Crotalus horr. in the end was the rubric anemia hemolytic, which contains only two remedies: Crotalus horridus and Hirudo medicinalis. AIHA was the actual disease, the cause being, perhaps, the delusion of being forsaken. When the homeopathic history is reviewed, it might seem hasty to have change to Phosphorus. With the initial slow recovery and the feeling of panic at the time, however, that is how I dealt with the situation. When a blood transfusion is given at the same time as a remedy, it is easy to think that the remedy has helped, when it is in fact a response to the blood transfusion. Henri Stephenson is a small animals veterinary surgeon, working on the Sunshine Coast of Australia. i&apos;d like to have the e-mail of Henri Stephenson as my dog has Autoimmune Hemolytic Anemia. AHA is a difficult problem to treat. 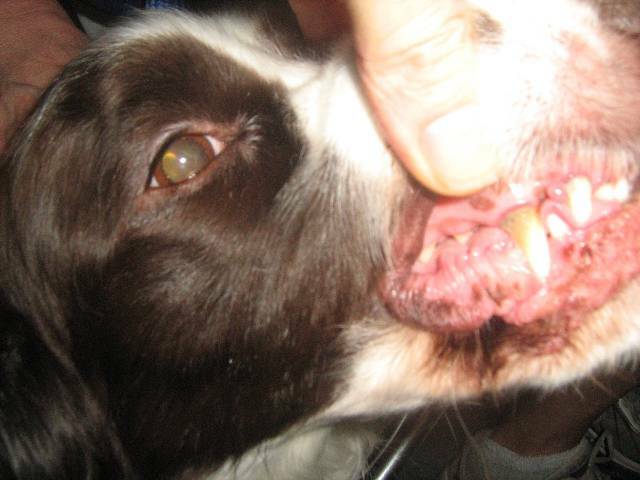 Your case demonstrates how homeopathy can be successfuly used in the treatment of serious veterinary disease conditions.